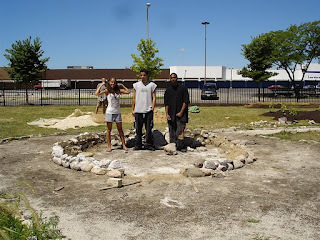 Students at North-Grand HS in Chicago are working with After School Matters and the Cob Connection to expand the school garden and build a gazebo from cob, a mixture of clay, sand and straw. Cover Story in Extra Newspaper! 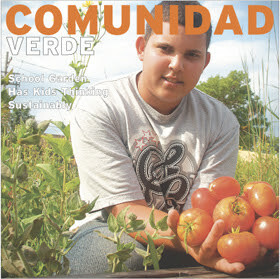 Chicago’s bilingual newspaper Extrafeatured the students of North-Grand HS in their cover story called Comunidad Verde, a Green Community!Read the whole story here! Please enter a comment so we can hear what YOU think about this project. Just click on the “Comments” link below and let us know what role you had in the project and what thoughts you have about it. After 6 weeks of hard work we finished the gazebo. It has benches and a table as well as an arched window and mosaics. It was built mostly from salvaged and recycled materials. As everyone said who came to see it during our living portfolio exhibit, our students have a lot to be proud of!In addition to the gazebo we’ve expanded our urban mini-farm, built a tool shed and a gateway trellis and have poured the foundation we will need to add a roof to the gazebo. Our neighbors and friends have enjoyed the harvest of tomatoes, broccoli, cherry tomatoes, swiss chard, cabbage, jalapeno peppers, zuchini, summer squash, green beans, lettuce, and more. We invited family and community members to come see our work. DJ Luis gave old-school spinning lessons and we enjoyed food donated by Domino’s Pizza and The Brown Sack Restaurant.A reporter from the EXTRA newspaper came to do a story about our project which should be coming out in the paper on Thursday. 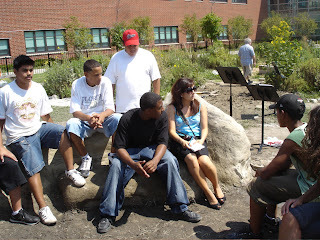 She interviewed students and visitors to the site as well as Chad and Mr. Cantor. 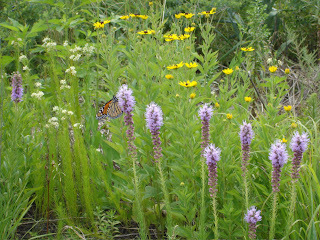 The prairie habitat is not only a restoration of the type of landscape that was here in Illinois before extensive human settlement, it is also a refuge for wildlife such as butterflies and birds. The gazebo is shaping up! We put in a window, and the walls are slowly rising. 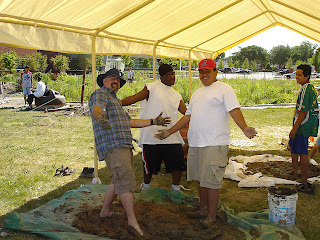 We re-did some of the tent supports and started clearing all the trash that has accumulated in the prairie restoration. We are seeing plants coming up from the new urban farm mounds and we planted more veggies along with sunflowers and pumpkins too. These amazing photos were taken by Nancy Behall who has been coming to document the work we are doing. Thanks for your support, Nancy! From student GC — Well 2day went pretty good. 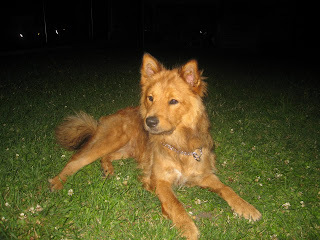 For the first time we had a dog in our project. I brought my dog, and everyone just loved’em. they played around him too. He was kinda jumpy when he got there. When I got there, I noticed that the tent we all put up, was taken down by the wind. We were able to put it back, and tie against the fence and put stakes in the ground to really support it. Lets see what happens next. Oh!! e also finished the tool shed. – PS the tent stayed up all weekend… no probs. The tool shed is finally about 99.9% done. We made 3 batches of cob today including one that is just about done and will be used on Monday. Mr. Meehan came by with some great ideas for building our roof, and got our first materials list together. We spend a lot of time re-building the tent and staking it down so it doesn’t blow away again. Each day we learn a set of new skills and concepts… for example, improvising the tool shed and the tent supports will help us design and build a strong roof for the gazebo that will last many years. I don’t have much to write today, but it was cool. Today most of the time I took it easy, I admit but you have to work hard to own your own stuff. Fue un dia bueno iqual que otros. Levantamos la carpa y reamos mas barro. En fin fue una buena semana. Today we did some cob and fixed the tent that fell down and I think I did OK. Today wasn’t as hard as before. It was very hard and fun. I played a little too much today, but it was fun. Thursday was the fastest day. We finished the foundation and time flew by. It seemed that we were here for only two hours, and its only our second week. Today I fixed the garden with the vegetables (watering, adjusting calcium with lime, and cultivating) and also started building a worm composter. It was my first time building something like that and it turned out good. from JM: I’m proud. I think we did a lot in just a few days. I work hard. This day was fun, nasty, and dirty. We made cob and had fun.from FC: Work on a team/You will work hard and strong. from RS: Presenting the TREE of LIFE… made of concrete and cob… built by many giving hands and feet… strenth in the muscle…. but the one of the most important attributes is understanding…. the understanding that building the wall in scupture…. 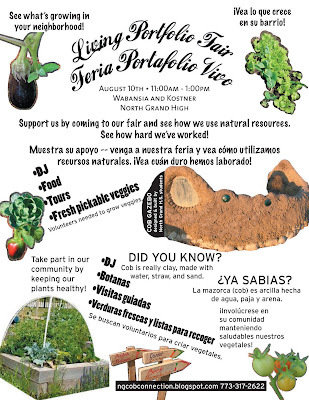 might just bring the community together. from NC: I met a lot of good friends… they really make me laugh. I’m glad they are my buddies. from GC: The tool shed is finnaly, well almost, finished. All we need is to finish the door and roof. Everything we’ve done in the garden is starting to take shape. The gazebo foundation is nearly done. But at the same time we are having fun…we mess around and play around, but still get the work done. from AC: This week was really hard. We did a lot of work. At first I thought that this job was going to be slow. After the first day we did a lot of working and the days go faster now. I didn’t think we were going to have a lot done the first week, but we have. So far its been OK. Some days it feels like I don’t want to go to work and other days it feels OK.
from JS: I am learning how to make a cob home out of mud, straw and water. I like how this is going with cob. from WA: It was a good day. I worked hard and got stronger. The tool shed will be done in maybe 2 or 3 days. I’ve leanred a lot of good skills, like to be a carpenter. I am considering being a carpeter after the work I’ve done. from EN: Today was good, like I always say. When this six weeks are done I’ll be glad because I’ll be looking at the garden until I graduate. I just wish to have a chance to be able to do it again. After digging a trench and laying in chunks of concrete students use cob, a mixture of clay, sand and straw, to fix the concrete in place; creating a strong foundation for the gazebo they are designing for the school habitat/garden. 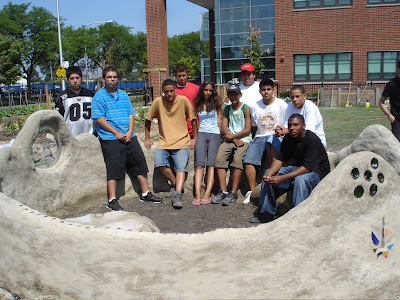 The Cob Connection builds community by building cob. 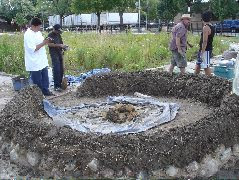 Using the adobe-like mixture of clay, sand and straw, just about any type of structure is possible. 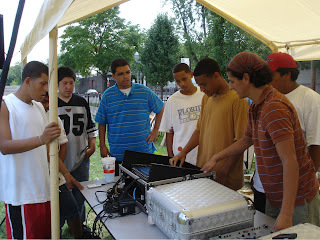 When people build together they develop skills and discover resources that enhance communities. For more information about cob or the Cob Connection contact Chad Bliss atcobconnection.chad@gmail.com . Dr. Ayala invites students to educate her about cob.